The College Bar Finder is a Google Maps mashup that can help you find a sympathetic bar for your favourite college team, particularly in cities which are distant from your school's home. You can enter your team in the search box and a list of bars will be displayed on the map and in the map sidebar. The site also has a number of handy quick links to zoom to major US cities. The site includes search suggestions so, as you type in the search box, the appropriate college teams are suggested below the box. 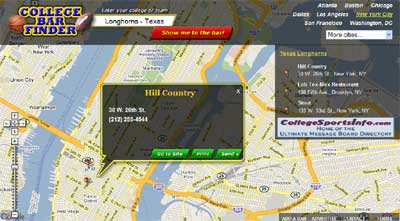 Currently the College Bar Finder has over 1,000 bars in its database and it also includes the option to add a bar to the map.